Marvel Fans pay close attention to the Olympic advertisements during the Super Bowl you may notice a theme. To promote the Winter Olympics NBC is releasing 5 "Best of the USA" 60 second videos during the Super Bowl. The Super Bowl airs on Sunday Feb 4th. Some of the videos have a Marvelish theme tying the athletes to certain Marvel heroes. The first commercial focuses on Colorado's own Mikaela Shiffrin. Mikaela is shown sporting her patriotic Captain Marvel uniform. The video explains how Mikaela came up with her A.B.F.T.T.B. "Always be faster than the Boys." She rocks out on the slopes to Chuck Berry's "Johny Be Good". Shaun White Meanwhile is getting the Iron Man treatment in this completely awesome video. While Shaun does not wear any Iron Man gear himself the whole video is played to Black Sabbath's song "Iron Man". Am I crazy or is there a Marvel theme here? 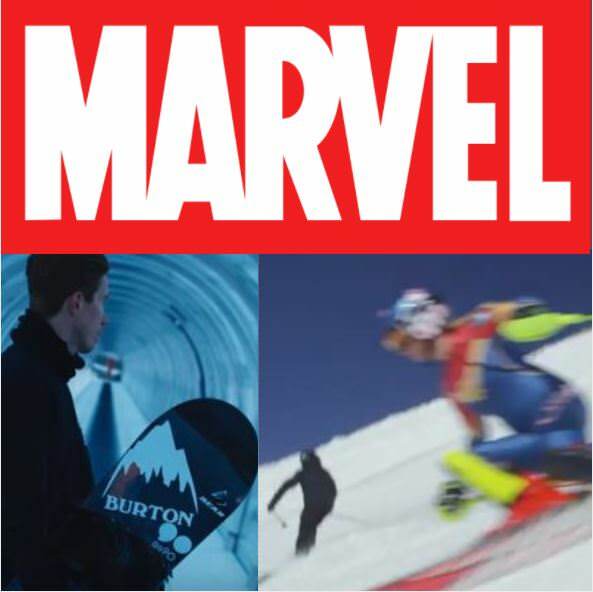 I don't know of any real deals other than one to use the Captain Marvel motiff on the USA Woman Ski team uniforms but these ads both link to Marvel. Could NBC trying to make each of these videos as a Olympians Marvel styled origin story? Both commercials are some of the most expenisve that will be released on Sunday and so far look very awesome. I can't wait to who is next.